Speaking at the conference, Ms Vu Thi Phuong, Deputy Secretary General of Vitas, said that each FTA has its own rules of origin. Exports must meet requirements on rules of origin to enjoy preferential tax rates governed by relevant FTA agreed by both sides. However, the practical use of tax incentives from signed FTAs has been quite low. Currently, only 35 per cent of Vietnam's export products make full use of the opportunities provided by FTAs, while 65 per cent are still subject to high tariffs. One of the main reasons is that Vietnamese firms lack knowledge about origin. In addition, some rules of origin stipulated by FTAs is tight, but our companies still cannot meet them. EVFTA negotiations concluded in December 2015. To realise its benefits, Vietnam and the EU agreed to quicken the ratification and bring it into force in 2018. The time is not much for garment and textile enterprises to prepare till then. However, Vietnam's textile and garment market share in the EU is low, she added. By the end of 2015, Vietnam's textile and apparel products accounted for only 1.9 per cent of the share in the EU since they are imposed a high tax rate of 8 - 12 per cent. This reduces the competitiveness of Vietnamese textiles and garments. After seven years of EVFTA enforcement, all textiles and garments exported to the EU will be entitled zero tax, giving a huge opportunity for Vietnamese textile and apparel companies to boost their market shares. 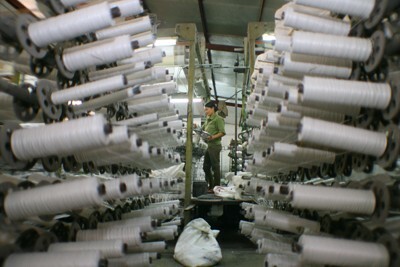 However, rules of origin of fabric hurt weaknesses of Vietnamese exporters. “To take advantage of opportunities, domestic garment companies need to recalculate their appropriate investment and business strategies and shift from low-valued cut, make and trim (CMT) to higher value forms of FOB (free on board) and ODM (original design manufacturing),” Phuong added. Sharing Phuong’s viewpoint, Ms Dang Phuong Dung, Deputy Director of Vitas Advisory Board and EU-MUTRAP specialist, said, EVFTA tax incentives will bring golden opportunities for textile and garment firms to expand export markets. Nevertheless, the biggest obstacle to Vietnam’s garment and textile shipments to the EU is the rules of origin as they mainly rely on imported fabrics from China. Although Vietnam signed many new-generation FTAs with ASEAN, South Korea and Japan with the rules of origin from fabric afterwards, its manoeuvres of rules of origin are still limited. Mr Stefan Moser, EU-MUTRAP specialist, said, in order to meet the requirements of EVFTA rules of origin, exports to the EU must meet the requirements of fabric produced in Vietnam or the EU, or from one-third country which has had FTAs with Vietnam and the EU. However, the rate of utilisation of bilateral rules of origin (EU imports of fabric for production and re-export to the EU) is very low because the price of EU fabrics is very expensive with a high transportation cost. “EVFTA opportunities are huge, but meeting rule of origin requirements is mandatory for enterprises. They must be prepared in all aspects to make the most of opportunities,” he emphasised. At the conference, EU-MUTRAP specialists in rules of origin also clearly answered questions relating to EVFTA rules and procedures of origin certification raised by attending enterprises. This is really useful knowledge and information for Vietnamese garment and textile companies to enter EVFTA-ruled markets. This helps businesses not to be ruled out from the game, but also effectively utilised preferential tariffs, thus raising their chance of success. How Has Vietnamese Tra Fish Been Discredited?